This is the second and final 10k race of the year organised by New Marske Harriers as part of their Coast Road series. The race starts at the Mermaid pub in Marske and finishes on the Coast Road opposite the Fox Covert. It is a fast flat course run on roads and pavements. It was a sunny but windy morning and after a warm up run towards Redcar it was obviously going to be a struggle to get a good time with the wind gusting up to 34kph! As the race starts and loops around the Churchill Drive estate we were all sheltered from the wind for the first 2k and even heading down the Coast Road it was not a problem. At the 5k mark as I rounded John’s Corner, at the bottom of the Pink Path, the full force of the wind hit me head on and my pace dropped by 15 seconds a kilometre. At this point the group I had been pacing pulled away and Kath Aspin from New Marske Harriers became my new running partner. I maintained my new pace for the second loop of the Pink Path and then came the long slog up the Coast Road to Marske. With 300 metres to go I managed to find another gear and pulled away from Kath and crossed the finish line in a time of 40:51. Not a PB but my second fastest 10k and considering the conditions a satisfying run. 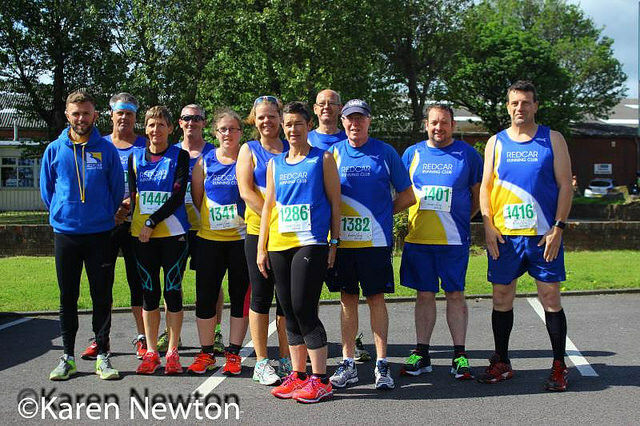 Out of the 195 finishers there were 15 runners from our club, 10 men and 5 ladies. Our first man over the line was Chris Dale in 39:53, second was myself, Paul McDermott in 40:51 and third male was our Club Captain Phil Noble in 48:43. Our first lady finisher was Debbie Warren in 50:10, second lady was Louise Ellison in 51:00 and third was Elaine Darlow in 56:35.